Welcome! On the following pages you'll find images of various styles of hand made handspun hats created from a wide variety of natural fibers including a nice selection of fine sheep wools, llama wool, mohair, alpaca, various types of silk, and even a bit of New Zealand opossum down. On the Doggy Hats page you'll find hats made from handspun pet hair, such as malamute, chow, great Pyrenees, Afghan hound, and poodle hair. I also spin plant fibers such as hemp, cotton, bamboo, tencel, soy silk, and flax (linen) for the perfect lightweight spring and summer hats. All of the yarn for my hats is handspun and hand dyed, and all designs are my own original creations. 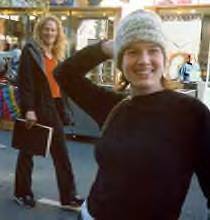 I do not use commercial yarns or synthetic fibers other than occasional bits of angelina (sparkly fiber made for spinning) or cut up bits of novelty yarn, which are found only in the art yarns I make for my Lumpy Knit Hats and some of my Skull Caps and Round Caps. My art yarns also sometimes include beads, ribbon, lace and feathers. When washing and dyeing my raw wool fiber, I use mild soap and the best high quality crafters' dyes I can find. This insures that the natural lanolin will not be stripped from the fiber. Lanolin is good for the skin and is often an ingredient in hand lotions and skin creams. It makes the hats soft and kind to the skin as well as water repellent. 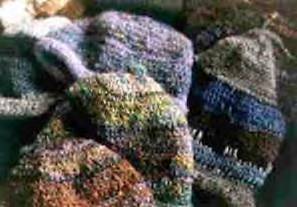 The creation of these hats is a form of wearable fiber art. I don't use set patterns, but make up the designs as I work. So this is an ongoing, evolving process, leaving open the possibility of new designs occurring at any time. Although my hats have a certain similarity in style, I can truthfully say that I have never made any two exactly alike. Each hat is a unique, one of a kind fiber art project. 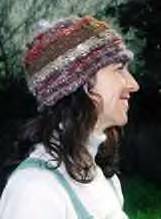 I crochet most of the hats, though I also make some very nice knit hats as well. 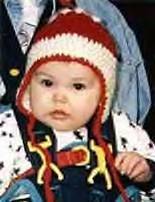 You will find a variety of styles of handspun hats on these pages, including ski caps, beanie hats, skull caps, hemp hats and caps, silk caps (sometimes), cotton and linen caps, tams (also called berets), baby hats, watch caps, and knit hats. However, due to the considerable amount of time it takes to make each hat, I am unable to produce a huge inventory. All hats currently available for sale can be found on the Hats Now in Stock page, which is constantly updated as hats are sold and new ones created. I can also attempt to make a custom hat similar to any of the hats that you may find on other pages. On the Scrapbook page you'll find photos of some of my happy customers. 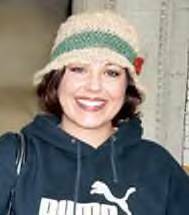 I've also now added a new Hats 'n Scarves page where I have scarves that go with some of my fancier hats. Custom orders are welcome from January through September. I'm unable to accept them from October through December due to increased demand and need to prepare for holiday craft fairs. For instructions on how to order a custom hat, please see the How To Order page. 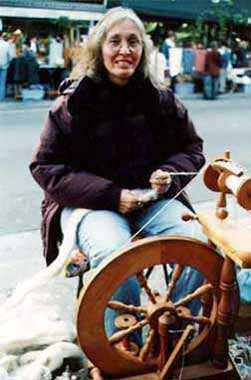 sometimes find me with my spinning wheel at local Farmers' Markets. One-of-a-kind hand made handspun hats and caps created from all natural fibers and hand dyed with finest quality dyes and plant extracts.